If you’re like me, you had no idea that twins went much beyond identical and fraternal. Since we have not a one set of twins in my family, I didn’t really ever think about it. Turns out that there’s four levels of twins and as they move up a level, the more risky the pregnancy. Here are the basic facts about twins that you’ve been dying to know. Fraternal: Almost like two separate pregnancies happening at once. Each baby is in their own placenta and their own sac. Usually happens within the first 3 days of conception because the Mama has more than one egg. Mixed gender twins are always fraternal. Interestingly enough, fraternal twins can still look super alike. Mary-Kate and Ashley Olsen, for example, are fraternal twins. 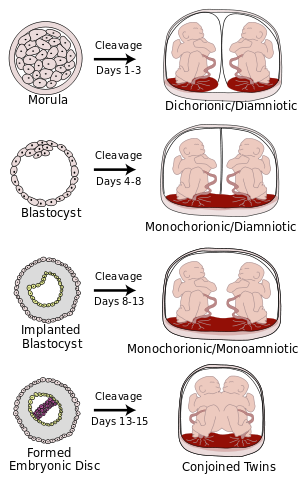 Identical: Happening within the first 8 days of gestation, identical twins share a placenta, but are each in their own sac. Identical twins are always the same gender, either two boys, or two girls, despite people asking if your mixed gender twins are identical. Momo (Monoamniotic, monochorionic): Identical twins formed between days 8 and 13, the babies not only share a placenta, but also a sac. This can lead to several problems, but mostly has a high risk of the cords tangling or one baby not growing while the other thrives. Googling mono mono twins when I first found out terrified me to the point of tears. Conjoined twins: I obviously knew about conjoined twins, but only recently learned of how close mono mono twins can be to becoming conjoined. Happening between days 13 and 15, they are the highest risk, but thankfully, the least common form of twins. So there you have it, the basic info on momo twins, just like the ones I’m carrying in my big belly! This entry was posted in Basic info and tagged momo, pregnancy, twins. Bookmark the permalink. Thanks for the great explanation!